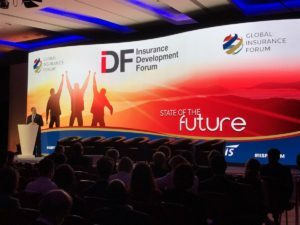 With major ground-breaking public-private initiatives about to be launched to kickstart insurance in previously underexplored markets, leaders of the Insurance Development Forum (IDF) at the annual Monte Carlo Rendezvous de Septembre, invited re/insurers to “invest” in their future. The IDF is a public/private partnership led by the insurance industry and supported by international organisations, it was officially launched last year by leaders of the United Nations, the World Bank and the insurance industry in 2016. Its aim is to facilitate greater collaboration and coordination between the re/insurance and private sectors to optimise and extend insurance penetration and its related risk management capabilities to build resilience in disaster-prone regions. Rowan Douglas, CEO of Capital Science and Policy, Willis Towers Watson, said the IDF and re/insurance industry at large is “at a really important inflexion point” as for the first time a global centre for disaster protection is preparing to launch major interventions which are expected to be supported by at least a dozen countries looking to develop public-private partnership programmes early next year. The German government, in a linked programme, the InsuResilience Solutions Fund, created a fund of about 30 million Euros to support companies to work with governments or others to drive insurance programmes in particular territories. These initiatives represent a major shift in the re/insurance timeline – a pivotal point where the industry has come to be viewed as a significant building block to achieving key development goals – and global initiatives to facilitate wider insurance penetration are being launched. According to the IDF, research shows a 1% increase in insurance penetration can reduce the disaster recovery burden on taxpayers by 22%. A key goal of the UN Agenda 2030 is to take a risk-based approach to manage the risks of extreme events and climate. Within the frameworks that form the UN Agenda 2030, insurance is explicitly recognised as a key vehicle to enable the risk sharing and transfer solutions required for greater global resilience. As the IDF goes “from preparation, into practice,” Douglas invited the industry to look at how and where they want to get involved: “So for any firm, or public sector entity, while we may agree on the overall objective, some will want to involved in Bangladesh, some will want to get involved somewhere in the Caribbean, some would get involved in the modelling side. “What I would say is, two things – one we need some sweat equity, sweat equity is usually the easiest thing to get. “We want sweat equity though that sees this as core business, and this is core business, this is about building our industry, and also frankly about changing the hearts and minds of key policymakers who tend to come from the worlds of banking, asset management and economics, they don’t have insurance people generally, we need to get our top people in those corridors of power. He added that to address the protection gap on a significant scale, the industry would have to shift to a more collaborative modus operandi. The IDF views a coordinated approach between the re/insurance sector and relevant stakeholders as critical to meeting UN 2030 Agenda goals and increasing insurance penetration globally. “If you try and address this issue as an individual carrier or broker, it’s immediately assumed that you’re picking somebody’s backpocket, we have this issue of trust, we are convinced that the way to deal with this, as an industry is to come together, we believe we’re much more powerful, working from that platform, then on an individual basis,” Douglas said.